You know winter’s coming when you start craving the comfort foods, partly because the heavy and rich are what our bodies need as the temperature drops and partly because the longer cooking times fill the home with the warm aromas of tasty expectation. 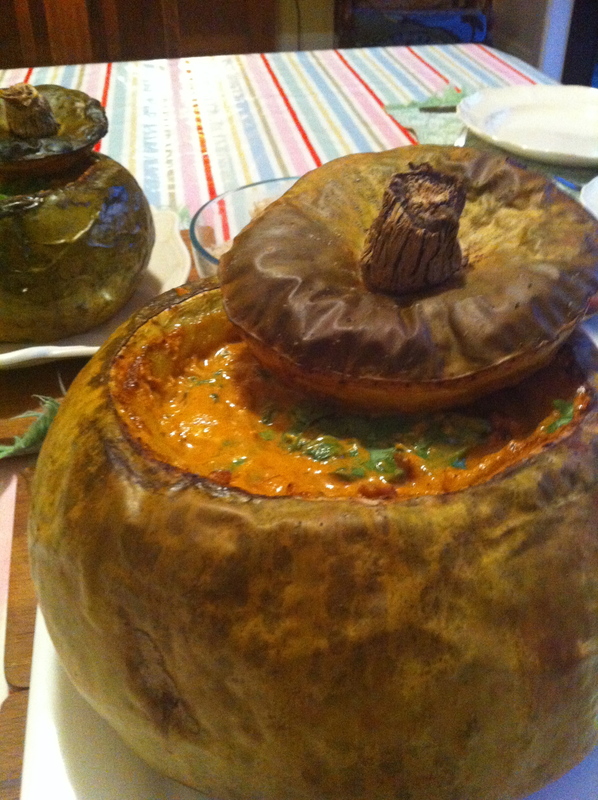 This recipe is my take on a Latin American Creole dish, which is basically a meat casserole served in a whole precooked pumpkin. Retro I know but trust me it looks so cool in the centre of the table when it’s dark outside and the fire’s been lit. The food world is now so fashion conscious that we all seem to lurch from one fad to another, without actually looking at the food culture origins that we are trying to use. The best example of this is the bazaar idea of Pacific Rim cooking, a fashion so fleeting that we’ve moved on already, to be honest only Peter Gordon ever really nailed it, for everyone else pacific rim was an excuse to just throw more stuff on the plate. So if fashion has moved through the old world and Asia, where to next? The answer is South America, the new shining star of global gastronomy. Choose a pumpkin with a decent stem on it as this will serve as a handle in the lid. Cut the top off the pumpkin to form a lid and scoop all the seeds and stringy bits out. Put the lid back on and bake for 1 – 1½ hours or until tender but still firm. Once cooked scoop a little more of the flesh out to give enough space for the casserole being careful not to damage the outer layer and skin. Meanwhile heat a few tablespoons of olive oil in a large pan and brown the meat on all sides. Remove the meat and set aside. In the same pan, adding more oil if necessary, fry off the onions, garlic, celery, capsicum and chilli until soft. Pour in the stock and bring to a simmer. Return the meat to the pan, add the tomatoes, bouquet garni and seasoning to taste, cover and cook gently for 45 minutes. Add the potatoes, kumara and corn to the pan and continue to cook for 15 – 20 minutes. Add the courgette and apples and continue to cook for a further 15 minutes. 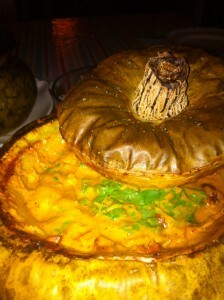 Spoon the casserole into the pumpkin and bake in the oven for a further 20 minutes. Carefully place the pumpkin on a serving dish and fish out the bouquet garmi before serving. Try a big, heart warming red with this. The Celebre from Ata Rangi is well up to the task.